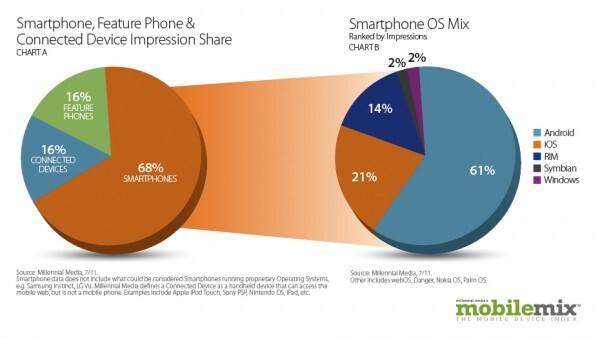 The folks at Millennial Media released their monthly Mobile Mix report this morning; a report that includes a pretty shocking smartphone OS breakdown. In July’s report, Android jump 15% month-over-month bringing their firm chokehold on the OS battle to 61% and also making that chart above just look silly. This is the 8th month in a row that Android has led MM’s report along with countless others from Nielsen, ComScore, etc. The real test now, is going to be whether or not they can hold onto that share when the new iPhone 5 is released some time in the next couple of months. With rumors that Sprint will also pick up our foe, is there a chance that these numbers could drop significantly for Android? Seems unlikely at this point. And with the number of almost over-the-top spec’d phones on the horizon from HTC, Samsung and Motorola, this Android train seems to be picking up more steam by the day. View the full report at Millennial Media’s blog.